How many times have I imagined myself speaking in front of stadium crowds? If I had a nickel for every time I planned all I would be able to do when my business was big enough to have a full-time team of employees, I’d be rich. The time I’ve spent worrying about my great products being stolen instead of putting them out on the public table could have built twice as many. 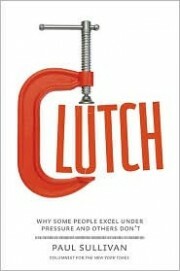 I find myself, again, personally challenged by Paul Sullivan’s insights into what does NOT result in “clutch” performance. To continue with myself as an example, when working on any given task my mind tends to jump ahead and begin anticipating a plethora of future issues, successes and/or problems that may arise. My attention and efforts then subtly shift to pre-addressing those issues. Yes, before they even become issues! It sounds funny and oddly obvious to say aloud, but that’s not how I am experiencing it at the time. Sullivan’s point is that such efforts are ultimately distracting, unproductive and sabotaging to the attention, focus and presence we need to be applying to the task at hand. I cannot be as authentically enthusiastic about the benefits and value of my services when I am thinking about how to secure a sale. I end up coming across as a salesman instead of a trusted advisor. When I am not in my head thinking about the sales process, but am fully present with a potential client, listening to their workplace issues and helping them succeed, I come across calm, confident, attentive, thoughtful and insightful. I come across as the safe yet out-of-the-box ally that leaders love to have on their side when addressing their complex challenges. My challenge, then, becomes being able to catch myself “overthinking” instead of performing. The earlier I can catch myself, the earlier I can adjust. The more often I catch myself overthinking and adjust, the more practiced I become in becoming a “clutch” performer. Focused, disciplined, adaptable and present. When and where do you find yourself overthinking things? How might you practice catching yourself in the act of overthinking and adjusting? What was your main take-away from this chapter? This entry was posted on Tuesday, March 29th, 2011 at 10:30 am	and is filed under Clutch by Paul Sullivan. You can follow any responses to this entry through the RSS 2.0 feed. You can leave a response, or trackback from your own site.